New ON1 Photo RAW coming at the end of the month. There will be a free public beta of this latest release available this Friday (October 6th). Along with the essential tools and features needed in a photography workflow, ON1 Photo RAW 2018 includes key updates to the fast, non-destructive raw processing engine. Photographers will now have an integrated tool with accelerated photo management, precise photo development, hundreds of customizable photo effects, fast and beautiful HDR, pano stitching, masking and blending adjustments, layers, and much more – in one app. ON1 Photo RAW 2018 will be available for download as a free public beta on October 6th from our website. Previous owners of any ON1 app (or ON1 plug-in) can upgrade for just $79.99, regularly $99.99. Those who don’t own an ON1 app can pre-order for $119.99. For a limited time, ON1 Photo RAW 2018 is will be bundled with some excellent bonus materials which include: Three ON1 Photo RAW 2018 Courses by Product Director Dan Harlacher, and all of their 2017 and 2018 Loyalty Rewards. A single purchase of ON1 Photo RAW 2018 works with both Mac and Windows and includes activation on up to five computers. The full release of ON1 Photo RAW 2018 is currently scheduled for the end of October, a free 30 day trial will also be available at that time. ON1 will also be releasing another update to the previous version, ON1 Photo RAW 2017, later this year. This update will include support for new cameras, lenses, and bug fixes. November 9, 2017 ­– Today, ON1, Inc. announced ON1 Photo RAW 2018 is officially available. Along with the essential tools and features needed in a photography workflow, ON1 Photo RAW 2018 includes key updates to the fast, non-destructive raw processing engine. Photographers now have an integrated tool with accelerated photo management, precise photo development, hundreds of customizable photo effects, fast and beautiful HDR, pano stitching, masking and blending adjustments, layers, and much more – in one app. Portland, OR -- February 28, 2018 ­--ON1, Inc. is pleased to announce the immediate availability of the new ON1 Photo RAW 2018.1, the first major free update to Photo RAW 2018. Version 2018.1 includes image quality enhancements, performance improvements, and key features to optimize the photographer's workflow. "Version 2018.1 isn't just about the new features, although there are many powerful new additions. We've been very focused on image quality and the results customers get from using ON1 Photo RAW. Image quality and performance are the top priorities in every update, and we are very excited for our customers to experience these improvements for themselves in this update," says Dan Harlacher, Director of Product at ON1. Debayering -- The algorithms have been improved to increase the amount of micro detail while reducing aliasing, yielding photos that are noticeably crisper with less color artifacts. HDR -- HDR alignment and deghosting have improved, yielding sharper results with less ghosting, noise, and color fringe. Users now have the ability to select which frame is used for deghosting and can also adjust the amount of motion visible in water and clouds. Faster Cataloging -- The thumbnail and preview generation of images is now faster. Searching photos has also been improved. Noise reduction -- Improvements to reduce large noise from very high ISOs. Automatic hot-pixel removal has been added, and green and purple color aberration reduction has improved. Sharpening -- The sharpening algorithms have been improved to enhance micro details and provide sharper initial results. Panorama -- The panorama merge dialog now does a better job with vertical panoramas as well as really large ones. It can now stitch together up to 25 photos at a time. Blending of photos to compensate for differences in exposure and white balance have been improved. Preview Quality -- The preview window has been improved to more accurately reflect the details and sharpness in photos at different zoom levels. NEW Import - Get photos from your camera to your computer, choose where you want the photos to go, assign metadata, and more. NEW Tethered Shooting - Get your photos to your computer instantly and apply import settings. Currently supports Canon and Nikon. NEW Soft Proofing - Simulate what your photo will look like when it's printed. NEW Metadata Templates - Add metadata to a group of photos using presets. This allows you to choose and save only the information you want applied to your photos. NEW Video Browsing & Organizing - Now supports viewing video files so you can organize those as well. Copy, move, name, add metadata, and more. NEW Custom Sorting - This option in Browse allows you to put your photos in any order you choose. NEW Batch Rename - Rename all of your photos in a batch to add unique information to filenames. NEW Edit Capture Date - Adjust date and time on your photos so they match the actual date and time they were taken. NEW Auto Advance - Automatically switch to the next photo during the culling process when rating or tagging photos. Additional Camera & Lens Support - Added support for several new cameras and many new lenses. Portland, OR -- May 10, 2018 -- Today, ON1, Inc. announces the new ON1 Photo RAW 2018.5, a significant update to Photo RAW 2018. Version 2018.5 will include a massive boost in overall performance, fixes for user reported issues, and new key features such as LUTs and camera profiles. "We're incredibly excited to unveil the new features in ON1 Photo RAW 2018.5 over the next several weeks. We plan on showcasing the new features and improvements through weekly videos leading up to the June release," says ON1 President, Craig Keudell. Camera Profiles - Select the same looks you see on the back of your camera in ON1 Photo RAW. Select from Natural, Portrait, Landscape, etc. depending on what your camera offers. These are not presets as they don't adjust any of the sliders, and are non-destructive. These will include popular cameras like Fujifilm®. LUTs in Effects - LUTs or Look-Up Tables are a favorite way to add matte, vintage or cinematic color grading looks. These will be available inside Effects in version 2018.5. A ton of LUTs will be available in the release along with individual packs from Matt Kloskowski, Tamara Lackey, and Hudson Henry. The common .3DL and .CUBE formats found online can be imported into Photo RAW. LUTs will work like any of the current filters in Effects. You can stack them, mask them and control the blending options. RAW+JPG - If you shoot RAW and JPG at the same time, you will be able to collapse and hide the JPG copy, so your library isn't cluttered. Any metadata or file changes you make are mirrored to the JPG seamlessly. Faster Film Strip for Culling -- Using the Filmstrip in Develop and Effects will be just as fast as in Browse. You will be able to switch photos instantly! You can even perform your editing and culling tasks, like ratings, labels, rotate and delete, while you are adjusting your raw processing. Transform Enhancements - The Transform pane in Develop will include new tools to correct perspective and rotation issues along with a new grid will make it easier to visualize results. Nested Presets -- Ability to better organize presets into a nested category structure will be added along with the ability to move, rename, delete, and nest presets and categories. Nested Albums -- Nest albums or photos inside of other albums. If you are migrating from Lightroom®, your nested collections are brought over by the Lightroom migration assistant. Improved Brushing Performance - Brushing with the Masking Brush will be more fluid and responsive, especially on Windows computers with large or high-dpi displays. Export Improvements - Exporting will be processed in the background so customers can continue to work on another job without having to wait for the export to finish. You can even stack multiple export jobs and continue working on your photos. Performance Boost & Increased Stability - Significant under the hood speed and stability improvements are coming in 2018.5. These include speedier switching of modules between Browse, Develop, and Effects along with switching and culling photos using the film strip in Develop and Effects. New Cameras & Lenses - Each update includes new cameras and lenses. The list is continuously updated, and we will share the final details when version 2018.5 is released. Each week ON1 will be adding videos showcasing the new features and improvements available in version 2018.5. Get a sneak peek of the new camera profiles, new LUTs, and overall performance improvements at www.on1.com/exposed. ON1 Photo RAW 2018.5 will be available this June. New customers can purchase version 2018.1 today and receive 2018.5 as a free update once it becomes available. ON1 is running an introductory price of $99.99 for new customers for a limited time (Reg: $119.99). Owners of previous versions of ON1 can also upgrade at an introductory price of $79.99 (Reg: $99.99). Version 2018.5 is a free update for all owners of ON1 Photo RAW 2018. A single purchase of ON1 Photo RAW will include both Mac and Windows installers and activation for up to five computers. It comes with a 30-day money-back guarantee, world-class customer support, hundreds of free video tutorials, and free ON1 Loyalty Rewards every month. May be they finally could make something fast and useful. Last time I chacked it was rather mediocre. We are excited to announce ON1 Photo RAW 2019, an all-new photo editing experience and a major upgrade to ON1 Photo RAW, available this November. ON1 Photo RAW 2019 will include an abundance of new features and technologies along with a streamlined workflow that is elegant, powerful, and easy to learn. 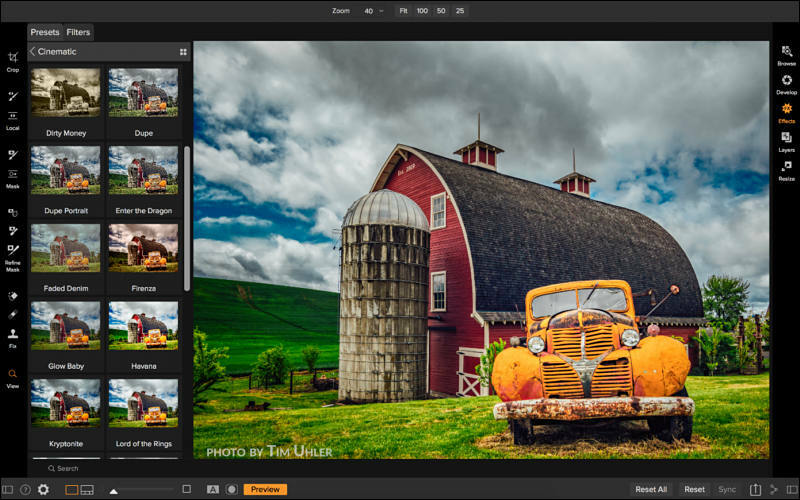 Notable new features include a new non-destructive workflow for layers, auto-alignment of layers, focus stacking, a new portrait module, a new AI-powered masking tool, a new text tool, new digital asset management updates and more. ON1 Photo RAW 2019 will include the tools photographers need in a single well thought out photography workflow application. ON1 Photo RAW 2019 -- An All-New Photo Editing Experience Now Available\ Portland, OR -- November 13, 2018​​ -- ON1, Inc announces that ON1 Photo RAW 2019, an all-new photo editing experience and a major upgrade to ON1 Photo RAW, is available today. ON1 Photo RAW 2019 includes all-new features and technologies along with a streamlined workflow that is elegant, powerful and easy to learn. Notable new features include a new non-destructive workflow for layers, auto-alignment of layers, focus stacking, a new portrait tab, a new text tool, new digital asset management updates and more. ON1 Photo RAW 2019 includes the tools photographers need in a single well thought out photography workflow application. The ON1 community drives the development of ON1 Photo RAW based on what's most important for their photo editing needs. Every new feature and improvement made in version 2019 is a direct result of community input through the ON1 Photo RAW Project. A New & Faster Editing Workflow ​​--​ ​​All of the editing modules from previous versions have been combined into the Edit module to create a single place for editing photos. The former editing modules are now available as tabs to allow you to work in each seamlessly without changing the application appearance. These include Develop, Effects, Portrait, and Local Adjustments tabs. A New Workflow for Layers​​ -- ON1 Layers is no longer a separate module. Instead, the power of layers is accessible within the non-destructive workflow in the new Edit module. This allows for creating or editing multi-layered files, including raw files, and keeping non-destructive settings for each photo layer. Customers can also move, size and mask each layer. More importantly, and a new concept, each layer has its own non-destructive settings, all the way back to the original file. What's most exciting is if you are working with raw files, powerful adjustments like exposure, highlights and shadows can now be processed using the raw data in a layered photo workflow. All without having to change modules or applications. 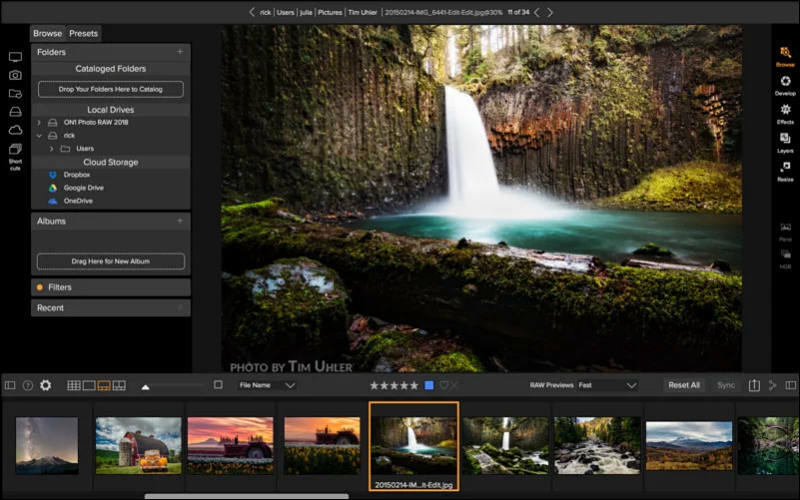 New Lightroom Photo Settings Migration​​ -- New AI-powered algorithms give customers the ability to transfer Lightroom edited photos, keep the non-destructive settings, and move them into ON1 Photo RAW 2019. The updated Lightroom Migration Tool in version 2019 transfers almost every edit you can make in Lightroom including raw processing, crop, retouching and local adjustments along with folders, photos, collections, and metadata. New Focus Stacking​​ -- Automatically blend a series of photos at different focus distances to increase depth-of-field. It's so fast, you can adjust the focus in real-time, just like changing the focus on your lenses. Think of it like HDR, but for focus instead of exposure. New Auto-Align Layers​​ -- Easily combine multiple photos as layers, then automatically align them based on image content, making it easy to mask and blend them together. New AI Masking Tool (coming Winter 2019)​​ -- This new tool, powered by machine learning, will allow customers to easily identify areas of their photos to create a selection or mask and the AI technology detects your subject matter and automatically creates a beautiful mask. New Portrait Tab ​​-- The new Portrait tab automatically detects faces in your photo allowing you to easily retouch, smooth skin, brighten and sharpen eyes, and whiten teeth. New Text Tool​​ -- The new text tool is perfect for creating posters, postcards, or adding your byline or watermark. Easily control font size, color, position, and more and then save a preset to add the same text overlay to a batch of photos quickly. New Master Keyword List​​ -- Now you can see every keyword you use in a single, searchable list. You can quickly apply, clear, edit, or delete keywords. Enhanced Local Adjustments​​ -- Local adjustments have been enhanced to use the raw processing data. This allows for more highlight and shadow details with more tonal range. This also includes new controls like haze, whites and blacks. New Layered HDR Workflow​​ -- With the powerful new non-destructive layers you can combine other photos, text or alternate exposures with your HDR photos. Use the powerful masking tools to combine multiple HDR renditions even. New Filter Options in Effects ​​--​ ​​We have added dedicated film grain, curves and color adjustment filters to Effects. These let you add film grain to color photos and make advanced, targeted color and tone adjustments faster. There's even a new filter selector that allows you to search for filters, learn what they do and even view a sample before you add them. New User Interface​​ -- The new user interface has a fresh and modern feel. Overall contrast has been reduced to make photos stand out along with a new font to help increase readability. Updated icons, tabs, and sliders will also take up less visual space. Other Updates ​​-- including support for HEIC files, keyboard shortcuts for changing modules, more accent color options, color labels on folders and more. Additional Camera Support​​ -- Added support for the Fujifilm XF10, Fujifilm X-T3, Nikon P1000, Nikon Z7, Panasonic LX100 II, Leica M10-P.
Additional Lens Profiles​​ -- Added lens profiles for: Canon EF35mm f/1.4L II USM (750), Chinon Auto Chinon 35mm f/2.8, KMZ Helios-40 85mm f/1.5, Nikon 200-500mm F5.6 174, Panasonic LEICA DG 8-18/F2.8-4.0, Panasonic LEICA DG NOCTICRON 42.5/F1.2, Pentax Pentax SMC Takumar 50mm f/1.4, Sigma Sigma 17-50mm f/2.8 EX DC HSM, Sony FE 24-105mm F4 G OSS, Sony FE 50mm F1.8, Tamron 14-150mm F/3.5-5.8 DiIII C001, Tamron SP 24-70mm F/2.8 Di VC USD G2 (A032), Voigtländer Voigtlander Super Wide Heliar III. "As we've said before, we have big plans at ON1. Our team is already busy working on the next free updates to version 2019. These will include dual display support, an editing history, and additional capabilities and enhancements to Focus Stacking," says Craig Keudell, President of ON1. State-of-the-art processing engine providing a fast, smooth, comfortable, and fun photo editing experience while producing the highest quality results for your photos. ON1 Photo RAW 2019 supports RAW files from over 800 cameras, but it isn't just for raw files. It also supports file formats include JPEG, TIF, PSD/PSB, PNG, HEIC and DNG are supported and benefit from the speed, performance, and abundance of editing tools in the app. Photo RAW 2019 will also integrate as a plug-in to Adobe® Lightroom Classic CC and Photoshop CC as well as Apple Photos and will continue to work as a standalone photo editor and rival the Adobe Photography Plan. Like the current version, version 2019 will integrate with the major cloud services to allow for uploading, managing, and editing photos across multiple computers. This enables users to sync photos and their edits across multiple computers or in a studio setting. Improved Focus Stacking --- The Focus Stacking algorithms have been improved. This makes the alignment of each photo more accurate and the blending of the photos produces less speckling in the bokeh regions and water. You can also output the results as layers with layer masks so you can tune the results manually. You can also zoom and pan the preview in the Focus Stacking dialog. Portrait Improvements --- The accuracy of face finding has been improved. It now finds more small faces and less false faces. You can also delete faces. Masking Improvements --- Inverting and copy/pasting masks are now more predictable. Adobe® Lightroom® Plug-in Improvements --- The Open as layers option now saves the results as a layered PSD or flattened TIF/JPG based on your preferences and round-trip with Lightroom. The migration assistant now migrates the pick flag from Lightroom to the Like hearts in ON1 Photo RAW. Import/Export Keyword List --- You can no import and export the keyword list. User suggested improvements --- The Crop tool preset is now remembered across photos, You can reset the layer properties, cursors are more precise for plus/minus modes, scroll position is maintained when culling with a filter enabled. Added support for these cameras --- Nikon Z 6, Nikon D3500, Sony XH99, Pentax K-1 II, Fujfillm GFX 50R, Leica C-Lux. We are excited to share with you the official release of ON1 Photo RAW 2019.2. This is the latest free update to ON1 Photo RAW 2019, and it includes a powerful new masking feature that leverages AI for generating masks as well as performance enhancements and new camera support.